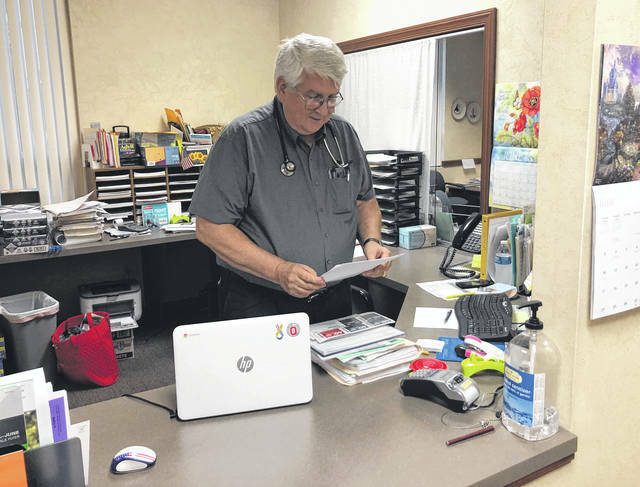 Scott Halasz | Greene County News Dr. A. Patrick Jonas, along with associate Dr. Rebecca Cherry, stopped taking insurance and are now Direct Primary Care physicians. Patients pay a monthly membership and a per-visit fee. Drs. Mary Beth Rodes, Sarah Khavari, and Phil Whitecar are Direct Primary Care physicians, meaning they don’t take insurance. Instead, patients pay a monthly fee with very few extra charges. BEAVERCREEK — Imagine going to the doctor, paying $20 or $30 and not having to worry about what insurance will and will not cover. It actually exists at two medical practices in Beavercreek. Neighborly Family Medicine and Beavercreek Family Health Center near the Mall at Fairfield Commons are part of a growing trend of physicians who offer Direct Primary Care, an alternative payment model which improves access to high-functioning health care. The concept is simple. Patients pay a one-time enrollment fee, a monthly membership fee and depending on the practice, a per-visit fee. Memberships include checkups, care of acute problems, chronic diseases, prevention, EKGs and nebulizer treatments. Small additional fees are sometimes charged for injections, minor surgical procedures and in-office testing, depending on the individual practice. At a time when health care costs are going up and out-of-pocket expenses are in the thousands, DPC gives patients a clear picture of what they will be paying. “It’s generally a cost-saver for most people,” said Dr. A. Patrick Jonas of Neighborly Family Medicine, located in the Acropolis. It’s also a nice change for doctors, who are pressured to see as many patients as possible each day because insurance reimbursements are getting lower and lower. Doctors are forced to see multiple patients at a time because of concerns about the financial bottom line. “It’s quantity more than quality,” said Dr. Sarah Khavari, who practices at the Beavercreek Family Health Center on Lakeview Drive. According to a study done by Medscape, an online database for physicians, the average primary care doctor spends 13-16 minutes with a patient. DPC doctors spend at least 30 minutes with each patient. Jonas said that time allows him to get the patient’s full story and come up with a treatment plan. He also has different decor in each treatment room to help individualize treatment plans. Khavari and partners Drs. Phil Whitecar, and Mary Beth Rodes had been on faculty at Wright State University and taught students the concept of spending more time with patients even though they weren’t doing that. “We weren’t exactly role-modeling it, so we decided to do it ourselves,” Whitecar said. They had done some DPC from the practice’s onset but made the full-time switch in March 2017. They still service their Medicare, Tri-Care and Medigold patients. “It’s been something we’ve been wanting to do for a while,” Khavari said. They had to wait for contracts with insurance companies to expire. “We decided, let’s not renew them,” Whitecar said. Without insurance to deal with, doctors don’t need massive billing departments and extra employees, meaning those savings can be passed on to the patients. “It’s really eliminated a lot of that aspect,” Rodes said. Jonas announced the switch last summer and on Jan. 1, 2018 the practice no longer accepted insurance other than Medicare, which had a contract until April. Whitecar, Khavari, and Rodes had similar experiences. Neither practice dispenses medicine and all five doctors expect their patients to carry a health insurance policy for ER and urgent care visits, hospitalizations, and prescriptions. But those policies can be tailored to fit the needs of the DPC patient, satisfy requirements of the Affordable Care Act, and keep costs down. That’s what Direct Primary Care is all about. 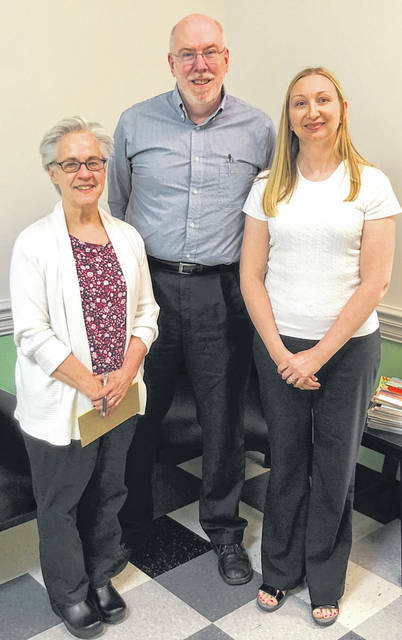 https://www.beavercreeknewscurrent.com/wp-content/uploads/sites/49/2018/06/web1_IMG_0897.jpgScott Halasz | Greene County News Dr. A. Patrick Jonas, along with associate Dr. Rebecca Cherry, stopped taking insurance and are now Direct Primary Care physicians. Patients pay a monthly membership and a per-visit fee. https://www.beavercreeknewscurrent.com/wp-content/uploads/sites/49/2018/06/web1_IMG_0918.jpgDrs. Mary Beth Rodes, Sarah Khavari, and Phil Whitecar are Direct Primary Care physicians, meaning they don’t take insurance. Instead, patients pay a monthly fee with very few extra charges.